Pelion is the perfect place in Greece to experience the true beauty and the natural landscapes of Greece. It is an amazing combination of blue and green, where the mountains meet the sea, and is ideal for those who enjoy camping and getting close to nature. The "Kastri Beach Camping" site is located on the lovely sandy beach of Kastri, which is perfect for those hot summer days. The crystal blue waters of the Aegean Sea are ideal for a refreshing dip. Close by to Kastri are the neighbouring villages of Platanias ( 6km ), Lafkos ( 13km ) and Katigiorgis ( 10km ). In these villages, you will find a lovely selection of tavernas, bars and other entertainment. At our campsite, we have a range of facilities including a cafe bar, restaurant, mini market, 3 washing machine, 4 fridges, common use freezer, dish washing area. The campsite is open from 10 May through to the 30 September. Whether you are travelling with a caravan or a tent, we have the facilities to cater for your stay here with us. The campsite itself is situated within a beautiful olive grove, providing natural shade. We have facilities for hot water and electricity. 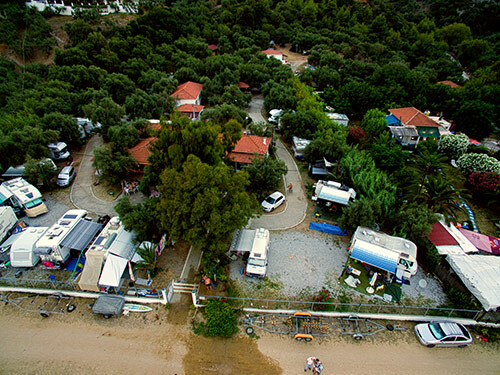 If you would like any further information about our camping facilities here in Kastri - Pelion, please feel free to contact us. We will be more than happy to help with any questions that you may have. We sincerely look forward to welcome you here to "Kastri Beach Camping" in the near future. The prices include all legal charges (VAT and fees). A 10% discount is allowed.